It was the moment the housing crisis hit home. IndyMac, a California bank that had grown into one of the nation's largest mortgage lenders, failed 10 years ago Wednesday. Even though most money in the bank was protected by the FDIC, the government agency that insures bank deposits, customers formed long lines outside IndyMac locations trying to withdraw their cash. It was a scene reminiscent of the bank runs of the Great Depression. It was also a sign of things to come in the financial crisis. In the year before IndyMac collapsed, only six banks had failed. In the year that followed, more than 10 times that many went under. By July 2011, more than 300 additional banks had failed, a rate of two per week. Rare was the Friday evening when regulators weren't seizing control of one more. IndyMac wasn't the cause of the banking crisis. But it was the poster child. For years, the overwhelming majority of homes in the United States had been purchased with mortgages that conformed to the strict underwriting rules of the two home loan giants, Fannie Mae and Freddie Mac. But in the early 2000s, investors started looking for riskier loans for which borrowers would pay a higher interest rate. Subprime loans went to borrowers with bad credit scores. IndyMac specialized in something different — what became known as Alt-A mortgages. Those were initially loans to people who had good credit scores but couldn't prove a reliable stream of income, such as the self-employed. 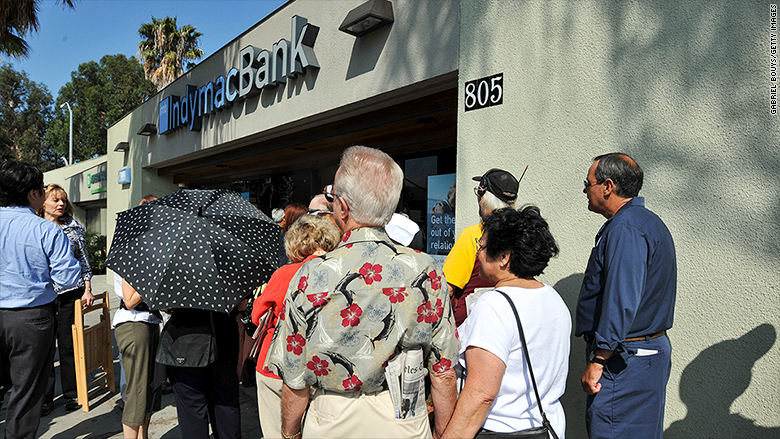 Customers line up to try to get their money after the failure of IndyMac in July 2008. By 2005 and 2006, for the first and only time, the dollar value of non-traditional loans such as subprime and Alt-A mortgages overtook the safer loans that Fannie and Freddie would accept. The value of the loans it made more than tripled, from $22 billion in 2003 to nearly $90 billion three years later. A relatively small bank became the ninth-largest mortgage lender in the country, according to data from Inside Mortgage Finance. IndyMac was growing fast by making loans to more and more questionable borrowers. "There was a rush to the bottom in terms of underwriting," said Guy Cecala, CEO of Inside Mortgage Finance. Many of those riskier loans were made not by banks but by mortgage lenders who were getting the money to lend out by selling the loans to investors. What made IndyMac different from many of those lenders is that it was using bank deposits to come up with the cash to make the loans. As long as home prices kept rising, as they did while the housing bubble was inflating, there were no problems. People could sell the home and walk away with more money than they owed. Once the bubble burst and prices started to decline, loan defaults started to mount. As home prices started to fall in 2007, some subprime lenders filed for bankruptcy. 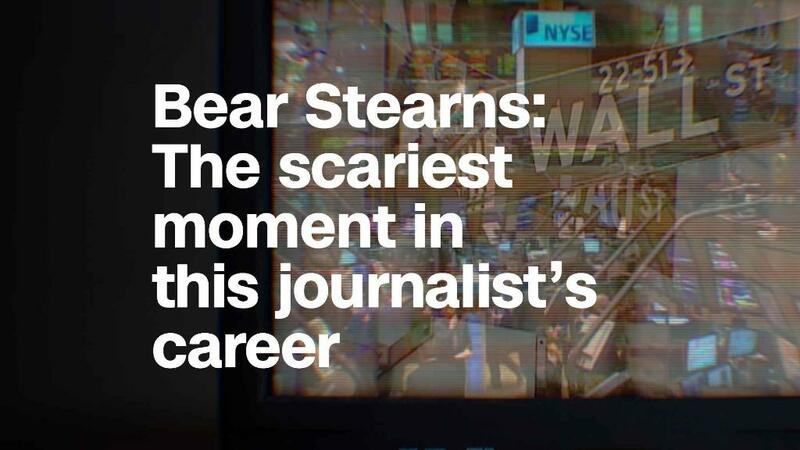 In March 2008, Wall Street firm Bear Stearns essentially failed because of its bet on the riskier mortgages, and it was sold at rock-bottom prices. Even Fannie and Freddie were losing money. But until IndyMac's failure, traditional commercial banks were mostly safe from the crisis. Shelia Bair, the head of the FDIC at the time, said regulators knew well before July 2008 that IndyMac would probably fail. She thought that was months away. But when some members of Congress raised questions about the bank's future, it sparked a rush by the bank's larger customers to withdraw their money, causing a cash crunch that sped IndyMac's demise. Once the FDIC took it over, things were even worse than its examiners had expected, she said. "It was unbelievable what was going on," she said. She said so many loans had been made with questionable loan standards that the bank's failure had become inevitable. The one major regret Bair said she has about the IndyMac failure was that the FDIC closed the bank early on the afternoon of July 11 because it wanted to notify members of Congress of the action before it got too late on the East Coast. That only fed the panic among IndyMac customers. "If your deposits were insured, it was the safest place in the world to have your money. But people were confused and scared," she said. "It was a mistake to close early. From then on we never did that again." IndyMac CEO Michael Perry insisted that he and other bank officers had done nothing wrong. He agreed to a $12 million civil settlement with the FDIC to help cover some of the losses. He only had to pay $1 million of that: The bank's insurance company paid the rest. Perry declined a request for comment made through his attorney. Bair said there was plenty of blame "across the board" for the problems that arose in the financial system. "Industry greed played a role," she said. "The regulators' role was to be the cops on the beat, and we didn't what we needed to do." "Congress fell down," she added. "We wanted legislation regulating lending standards. But everyone was making money and the banks lobbied against standards. The rating agencies handing out good ratings on securities backed by the loans — shame on them." She said she is concerned about more recent moves to undo regulations put in place after the crisis, including the Dodd-Frank financial reform law. "The reforms put in place were incremental. A lot of people including me thing they could have farther," she said. "But there is a trend back towards deregulation that is troubling."